This post contains affiliate links. Which means that if you purchase a product using one of my links, I get a small commission at no additional cost to you. Thank you so much for supporting Pennies Into Pearls by using my links! 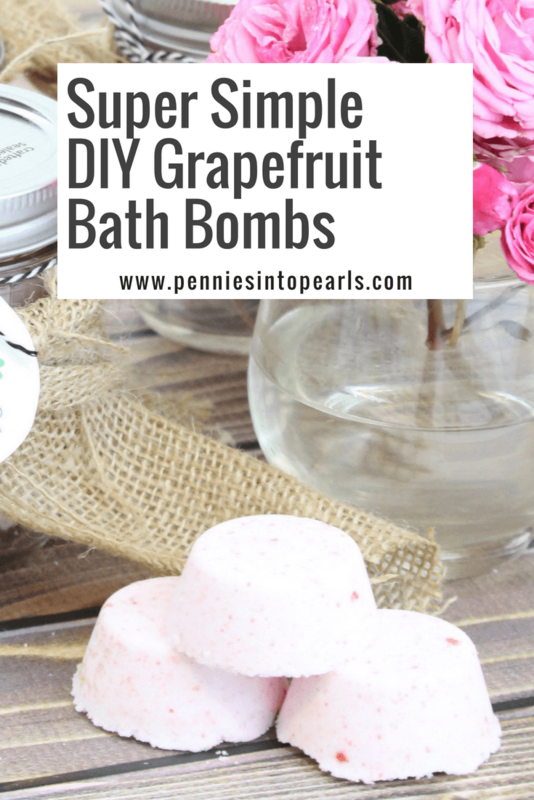 Who knew that making these DIY bath bombs was so easy? I haven’t given them much thought because I was thinking that they were this complicated formula of hard to find ingredients. Wrong-O! 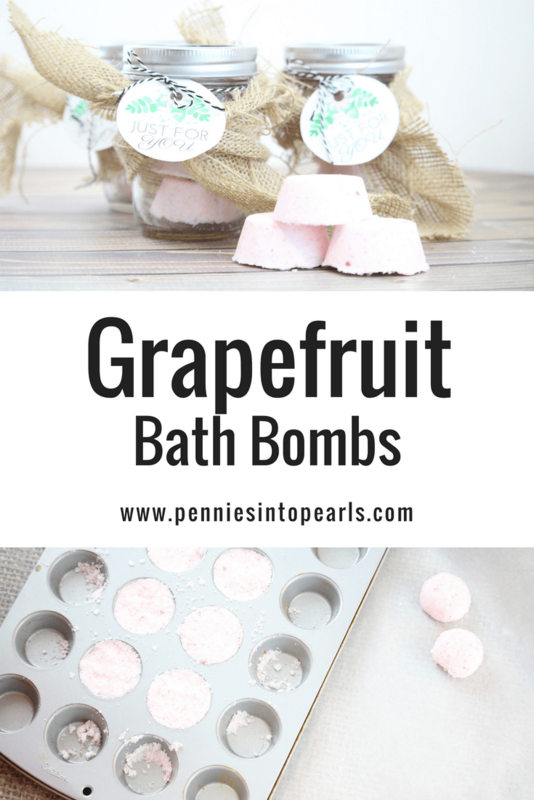 The most complicated ingredient when learning how to make bath bombs would be citric acid. But really, you can find that at any health food store. I found it in the bulk seasoning aisle at Sprout’s. What I love most about this bath bomb recipe is you can use it as a base and then add in whichever oil you like! Admittedly this is my first real venture in the essential oil world, but I am slowly learning how amazing they are! For this recipe, I used grapefruit scented oil and man! Let me tell you how delicious my bath smells. It’s like I am diving into a bath full of summer! Do you see how many awesome options there are with these! This is one of my first YouTube videos so don’t roll your eyes too much! Haha! But go and subscribe to my YouTube channel for tips on how to live your dream life on less! First you want to mix your dry ingredients together in a large bowl. In a separate smaller bowl, mix together all your wet ingredients, which would include melted coconut oil, essential oil, water, and food coloring. When I was making this batch I did forget to add the food coloring to the wet ingredients. Womp womp. I just added a few drops in during the mixing process and they turned out just fine! Then add your wet ingredients to the dry and mix until completely combined. You want the mixture to be somewhat dry but holds it’s shape when packed together. You can try squeezing some in your hand. If it holds shape, then you are good to go. If not, add ½ teaspoon of water at a time until it reaches the constancy we were just talking about. Then form the mixture into any mold that you like. They do sell actual bath bomb molds on Amazon. They were a little pricey for my needs, but they do end up making a pretty shape. If you have little helpers, they will be more than happy to help pat it all into place! You can try out using a cookie scoop (didn’t work great for me) or some mini or regular sized cupcake trays. Let the mixture dry in the molds for at least 12 hours. Then gently pop them out. You might have to softly tap the mold to remove the bath bomb. That’s it! Crazy easy, right? Now you are ready to relax! 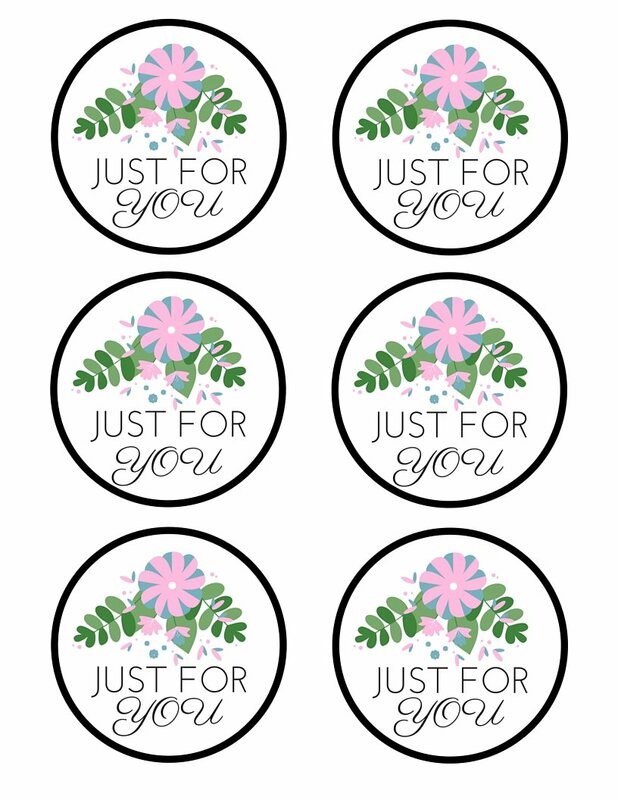 Since, you can make an entire batch of these for less than $3, there is no need to feel guilty using these on a daily basis! These are also the perfect gift for anyone. Really anyone is going to love these! If they like to relax, consider them sold! Here is a free printable for you to help dress up your gift! Don't wait another second to start saving thousands! Sign up below to get your FREE Meal Planning on a Budget Toolkit! In the Bath Bombs is the food color necessary? If I don’t add any, what will happen? I used a mini muffin tray for these and they’re still a little soft and stuck in the pan after about 20 hrs. I don’t know what I did wrong. 🙁 I followed your instructions to the letter. The moisture part is the hardest part! Try using a little less liquid and let me know how that works our for you. Hi Brittany I want to make these for my wife as a Christmas present but all the essential oils I find say don’t use on skin is this normal or am I buying the wrong thing? How many of these mini-muffin sized bombs does one batch make? i am looking to make these as gifts and need to make sure I am buying enough citric acid! Thank you! Hi Natasha! Each batch filled about one of my pans. So i think that is two dozen.